Depending on the context, VFX either stands for virtual fire extinguisher (not very helpful in putting out fires) or visual effects (very helpful in putting out fires or making realistic-looking fires). Several departments at Invetor Heads are responsibile for some real movie magic. In the Effects department we use design and technical skills along with cutting edge software to simulate complex structures and motion. We create shattering land masses of rock and ice, as well as send dust and debris crashing into the ocean, creating massive splashes of vaporized water. We build peaceful formations of clouds and calm rolling oceans and then turn them into tidal waves, rain and tornadoes. Sometimes we even help integrate moving characters to their environment with effects such as footprints and dust. Our Technical Directors are talented people with a good balance of art and technical training. It is no surprise that our backgrounds and interests are so varied. We have people from nine countries and who speak thirteen different languages. We have parents, hikers, rock climbers, photographers, painters, computer builders, a curler, break dancers, fitness enthusiasts, home brewers, composers, guitar players, an industrial electronic musician, a car racer, and a black smith and metallurgist. Our experiences range from escaping a communist regime to flying a plane. Perhaps the best thing about Effects is our sense of humor. We always tackle challenging work with a joke! The Invetor Heads Character Simulation Department creates character-specific visual effects for clothing, hair and skin. Working closely with other departments such as Design, Animation, Modeling, Rigging, and Fur, the process of Character Simulation adds physically accurate and visually pleasing motion to a character’s hair, skin, clothing and accessories. The addition of this motion, whether subtle or dynamic, helps flesh out the worlds we create, making the characters and environments even more believable. During character development, Character Simulation will work with the design team, as well as the Director and Art Director to assess the needs and expectations for each character. We then develop strategies to meet these challenges, refining the look, feel, fit and behavior of characters’ simulated elements. 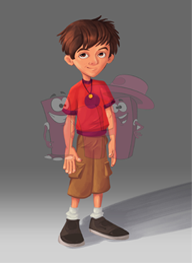 During production, Character Simulation happens in tandem with the work of the animation department. Character Simulation TD’s use combination of commercially available simulation software and in-house tool-kits to fine-tune the fit and physical properties of a garment in every shot. Character Simulation TD’s must use a combination of technical, aesthetic and creative skills to efficiently create an attractive and consistent result. The dynamic motion supplied by Character Simulation compliments the work of the motion created by Animation, adding weight, secondary motion, and personality to our animated characters. Whether it’s the folds of a character’s shirt, the swoosh of a villain’s cape or the subtle swing of a character’s hair, The work of the Character Simulation team adds to each shot, helping bring Invetor Heads’s stories to life. The Crowds department is tasked with filling the screen with characters. While we are the smallest department at Invetor Heads, we get to build scenes with the largest head count. We use both custom code and consumer software that take the models, rigs, and animated character clips built by the departments upstream in the pipeline and convert them into crowd assets. Essentially this means we try to make the rigs and models as simple and light as possible so we can shove as many characters into the scene as possible. Then the fun part begins: actually building and simulating the crowds. To create a huge crowd that looks dynamic and realistic we have to add a lot of variation to what the crowd characters are doing. The characters have to look like they really live in the scene. They should react to the environment, not walk into walls, wave when they see a friend, and run away or fight when they see an enemy. Since we are dealing with large numbers of characters, it would be impossible to hand animate each one. Instead, we create simulations to drive the actions of the characters. The simulations define the dynamics and behavior of how the different characters should interact. We might create a particle simulation that defines physical forces, constraints, and rules that guide how the characters behave. Then each character’s animation cycle is synced to each particle. We can build fuzzy logic brains for the crowd characters to allow them see, hear, and feel – so they can interact with other crowd characters and their environment on their own. No matter what technique we use, the main goal it to make the crowd characters look and behave in ways that appear as though they are “acting” in believable ways. Compositing is the stage of production where images of each element in a shot are combined and integrated to become one unified image. Compositing is a discipline that spans several departments at Invetor Heads, but the Compositing department is where all the final elements are balanced together into a seamless, unified product… the final frame. Picking up where the lighting department leaves off, different shots are given various levels of attention in Compositing. Tasks range from creating large vistas with digital matte paintings, creating and balancing atmospheric, volumetric, and environmental effects, in addition to handling more nuts and bolts tasks such as paint fixes, noise cleanup, and roto. Each and every shot in our films goes through compositing as the last creative stage of the monoscopic movie making process. 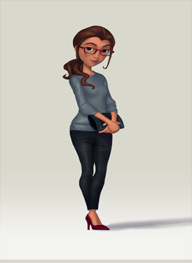 It is this attention to detail that helps immerse the audience in the picture and contributes to Invetor Heads’s mission to pioneer creatively superior photo-realistic computer-generated character animation. We’ve been pioneers in the motion capture industry for over the years.Our sound-controlled stage allows us to shoot large scale body-only stunt sequences, full performance with head mounted cameras, optical face markers and everything in between. We believe in using the right technology for your shot, not changing your pipeline to accommodate our technology. Our stage truly is the Swiss army knife of motion capture. Step one: Develop the perfect balance of comedy, heart, & giant action set pieces. Wait, you’re not done yet? Before anyone else can get to work on our movies, Story artists are busy figuring out how to transform a written script into the particularly visual language of animated filmmaking. Every story artist will draw different chunks of the script – bringing humor and specificity to the words on the page. They then “pitch” it to the Director. Hopefully, the director laughs. Hopefully, if the directory laughs, it was a comedic moment being pitched. If not, it’s literally “back to the drawing board” (except that everyone draws into computers). The basic elements of the story drawings show camera angles and sequence staging, but most importantly for animated features, the challenge is adding humor and character to the story. Story artists constantly think of ways to “punch up” the script. While many scripts deserve a good beating, that’s not what “punch up” means — it simply means we try to make it as gut-busting and hilarious as possible. Thousands of jokes will be pitched during this process. If one of yours actually makes it into the final movie, give yourself a pat on the back. Everything that makes it up on the screen was METICULOUSLY shaped, built and coded by expert craftspeople. The Inventor Heads Modeling Department is responsible for creating the first digital assets in the CG production process. Using high-end software packages Maya and ZBrush, we create all of the characters, locations, props and vegetation that you see on screen. Every Modeler in the Inventor Heads Modeling Department is at once an artist, a sculptor, a craftsperson and a technician. Every model we create has to be both aesthetically pleasing and technically sound. The character creation process begins with artwork that is provided by Design Department. This art consists of hard line drawings of the character’s head and body shapes and proportions, as well as loose pose and expression sketches. Depending on the character, we’ll sometimes also work from sculptures provided by the Sculpting Department called maquettes. Modelers are adept at translating this artwork into a 3D shape that will become the character you see on the screen. Using the materials provided, the Modelers will begin to explore and find the shape of the character in three dimensions, creating some of the first expression and personality poses as well as a neutrally posed model, ready to rig. Working closely with the Character Designers, Animators and Riggers, the Modeler will fine-tune this model into a pleasing shape that will be able to move efficiently and emote effectively as the Director intended. Once the character is finished in Modeling, it will go to Rigging so that it can be rigged with a skeleton so that it can move and perform. It will also be passed on to Fur to be groomed and Materials to be given it’s surface color and texture. The Environmental Modeling process is very similar to Character Modeling, only on a much larger scale. Working with drawings supplied by the Design Department, simple models from the Previs Department, and cameras from the Layout (Camera and Staging) Department, we will build the sets that the characters will perform within. We’ll create the ground they walk on, the homes they live in, the props they use, the furniture they sit on and the cars they drive, all within a virtual three dimensional world. We’ll create trees, plants, rocks and other ground cover that will be procedurally populated by the Assembly Department on landscapes that we create, as well as supply plant parts to the Fur Department so that trees and plants can be created procedurally as well. Once our models are completed they are made available to the rest of the departments and are ready to be rigged, groomed, materialized and animated. Have you ever looked at a film set when it was undressed? Shame on you. The fine, upstanding people on the Assemby team at Inventor Heads can’t bear to see such things, so they dress sets for a living. A shrub here, a carefully placed crate, some trees over here… they humbly use their godlike powers to make sure that the props and sets look fabulous in each shot. Ferocious dinosaurs, malevolent cockatoos, acorn-obsessed squirrels — they all arrive at the Inventor Heads Rigging department as a static digital sculpture, stuck in a single neutral pose. Our job is to take these creations from the modeling department and turn them into fully articulated, moving and breathing “digital puppets” to be posed out by our team of character animators. We study human and animal anatomy and video reference to understand how our movie characters should move. But it’s not only about how something would move in real life — assuming it’s even a creature that exists in real life! It’s also figuring out all the ways animators might need it to move to give a convincing and entertaining performance on screen. Animated characters — especially characters in Inventor Heads films — need to be capable of a tremendous range of motion and emotion, squashing and stretching far beyond real world limitations. We work closely with our animators, character designers and film directors to solve unique challenges, like a rare macaw that needs to gesture with its flight feathers, or the crafty smile of a weasel with a pesky underbite. Character TDs bring a broad base of aesthetic sense and technical know-how to bear on each character, using every software tool at our disposal. And when the tools we need don’t exist, which is more often than not, we build those too. The rigging process typically begins with creating a virtual skeleton, giving our character a structure for basic movement. On top of that, we may layer hundreds (or thousands) of hand-sculpted shapes, defining and designing everything from the giant jiggle of a belly to the tiny wrinkles at the corner of an eye. Then we rig up our digital puppets with all the controls the animators will need to bring the character to life in their shots. By the time we’re done, an animator can grab a hand and pull it into a pose, tuck a wing to a bird’s side, bend spines, pull open mouths, slide around eyebrows, make it breathe… Think of it as the world’s coolest action figure. Then we pass it into the eager hands of the animators, pause for a quick breath, and dive into our next challenge. It may be the hero of the film, or any one of a crowd of background actors — or it may not be a character at all. Whether it’s a scooter racing through the streets of Rio De Janeiro, a rickety bridge crumbling under the weight of an elephant, or even a tree branch bending gently in the wind — if it moves, we probably rigged it. The Fur Department is a procedural modeling and technical development department responsible for the fur, feathers and hair on characters, as well as various environmental challenges such as grass, leaves on trees or a light breeze across a field of clovers. Fur TDs not only develop the look of the fur on characters or leaves on trees, but also develop the tools to groom and color the fur descriptions, to rig and animate them, and light and render them. For characters, such as Scrat, the Fur TD is handed a “naked” model of the character and then adds the fur description defining the final texture and silhouette of the character. The fur description starts with an initial sampling of points over the surface of the character, then a pruning and weeding of points to get an even distribution and create bald areas where appropriate. Then at each sample point, each hair is grown point by point according to a procedural network of nodes: aims describing the direction each hair should grow, noises describing how much wiggle each hair should have, as well as clumping algorithms. Ultimately millions of hairs are written into fur files for each character, a small subset, about 1%, is extracted to become “guide hairs” for animators to add motion using custom ruffle deformers, or to add secondary motion using custom follow through nodes. For environmental work, the workflow is similar, but at a grand scale. Instead of generating millions of hairs, billions might be required for a field of grass or a forest of trees. Subsequently, we don’t necessarily generate every single hair uniquely. Instead we might replace each hair with a bundle of hairs describing a furry clover, or replace each hair with geometry describing a clump of grass or a leafy branch on a tree. Similar to character work, guide hairs are extracted that can be animated to create environmental effects such as wind on trees. At render time, each hair is drawn into camera space for each frame of the animation, sliced and filtered into a camera aligned grid of voxels, or volume pixels, storing the average orientation, color and density of hairs, or the average surface normal, color and material qualities of geometry such as trees or crowds. This voxelization process pre-filters the fur or geometry so that it renders as smoothly as possible, while managing the ram footprint of the scene: 30,000 characters in a crowd that might require 90 gigs as geometry can be represented by voxels using as little as 5 gigs. The voxels are cached to disk to be retrieved quickly for each subsequent render, rather than recalculated from scratch. Then the voxelized fur and geo is rendered and integrated with the rest of the scene through the lighting, compositing and stereo rendering processes. The Materials Department at Inventor Heads is responsible for applying color and surface textural properties to all of the 3D characters and set models in our movies. A Materials artist receives a 3D model or set as a blank slate, which basically looks like a gray clay model. We get to figure out how to make the model look more like the object or character it is meant to be, and give it some life and realism. Is it something organic like the bark of a tree? Or something man-made like a rusty motorcycle? A materials artist is constantly studying the real world around us — such as rocks, tree bark and even the frost on our windshields — in order to determine how things look and react. We try to re-create the complex color patterns of these surfaces as well as determine how reflective and bumpy they are. In computer graphics this process is called “shading” and we use small software programs called shaders to define these surface qualities. Every animation studio does things a little bit differently and Materials at Inventor Heads is no exception. We tend to use an in-depth process of creating materials using bits of code that generate specific patterns called “Procedural Shading”. We can layer different 3D patterns onto a surface using the many techniques we’ve developed to create a desired visual effect, which gives a unique look to our films. To become a Feature film ANIMATOR you must be equal parts ARTIST, ACTOR, PUPPETEER, AND NERD. Only the perfEct balance can bring a character to life on screen. You must also be one of the most patient humans on earth. Inventor Heads is home to some of the world’s finest character animators – masters of creating performances that infuse life and personality into our characters. During the early stages of pre-production, animators work closely with the Director, character designers, modelers, and riggers. It is the animators’ job to ensure the characters are expressive and able to perform all of the action required in the film. Will Blu’s wing enable him to fly? But what about holding onto the hang glider for dear life? Wait, he also needs to use his wings to gesture to get story point across??? These are some questions we ask ourselves early in the process and along with the Rigging department we make sure our characters are ready to perform! Before starting a shot animators will get a kick-off from the Director who’ll describe the goals of each scene – the action, context, subtext, ricechex, etc. It’s then up to the animator to work within that framework and come up with the appropriate acting choices. To accomplish this animators will shoot reference of themselves, draw thumbnails, and sometimes even do a quick 2D animation in order to better understand their scenes. After getting the ideas approved by the Director, the animator will work tirelessly, frame by frame, to bring the performance of each character to life! “Camera… action… lights!” This is the order in CG animation. Except nobody has to say it. Actually, nobody says that on a film set either. You’re learning so much today! Our Lighting department fuses technical savvy and a realist aesthetic sense to accomplish one goal: make every frame of the film look great! Drawing inspiration from our Director and Art Director, the lighting team uses Inventor Heads’s cutting edge technology and amazing know-how to complete the look of our films. In this stage of the process, the mood and emotion of our stories can be enhanced – and our character’s performance reinforced – by leading the viewer’s eye with strong, effective composition. The Lighting Technical Directors combine a mastery of Inventor Heads’s software and an artistic sense to add richness and subtle complexity to such incredible imagery. You don’t have to be a rocket scientist to work at Inventor Heads, but only because we already have some. It takes many incredibly brilliant minds to develop and maintain the technology behind our films. In R&D, the team writes software that our artists use to give Inventor Heads movies their signature look. Besides drinking lots of coffee, our team divides their time between doing research and writing software, or what’s commonly referred to as code. Research may involve staring out the window at the clouds or trees, playing with pieces of fur or blocks made out of peculiar materials, flicking our hair back and forth or simply looking at our own reflections in a mirror. Reading books and using the Internet counts as research too, but it’s more fun to stare out of the window and still be able to say you’re working. Writing code essentially involves telling the computer exactly what to do, like cooking a recipe except in much more painstaking detail. Computers require overwhelming complex instructions to complete even a relatively basic task. One step wrong in the code and the world comes crashing down, or at least the computer will. So instead of writing “use 1 cup of sugar” in a recipe for humans, one would have to write code that goes something like: Walk to the pantry, open the pantry door, scan contents for a bag with the writing ‘Sugar’; if not found, go buy sugar; otherwise raise arm to align hand with sugar, move hand forward to grab sugar, grab sugar, move hand back, close pantry door, walk to the kitchen drawer, open kitchen drawer, scan contents for cup measure; if not found, put down sugar and go buy cup measure; otherwise grab cup measure; etc. You get the picture. In reality, the example is not even detailed enough. How does a computer know what a pantry is or how to walk to it or even how to walk in general? The detail required to tell a computer what to do is mind boggling. So to avoid going insane from all the detail, we employ a tactic called ‘encapsulation’. I already used it in the above example where I wrote ‘go buy sugar’, which for humans is sufficiently clear, but not for a computer. In my example, I assumed that another software engineer had already spelled out how to buy sugar in all the detail required and encapsulated it in a so-called function called, say, “go buy”. Here is an example of a function that was written in R&D. A digital movie consists of 24 images per second and each image consists of pixels (about 2 million per image). Each pixel has a color. It’s our job to write software that determines what color each pixel should be. Somewhere in the code there is a function that figures out that color. The function is called “render”. The render function itself invokes lots of other functions and they in turn invoke other functions and so on and so on. Most of the time all goes well as function after function, pixel after pixel, image after image, movie after movie gets made. We smile, pat ourselves on the back and take a swig of coffee because we know just how good we are at writing those functions. But then all hell breaks loose. We choke on our coffee, cough until tears stream out of our eyes as we read the email announcing the trouble: Bad pixels in the freshly rendered images. Our render function failed! Crikey, now what? After the initial panic subsides and we can think straight again, we do the first thing that comes to mind: try and blame someone else. We look and look to see if any of the artists involved didn’t do something wrong. Sometimes they have, they are human after all, but sometimes it is our render function. If it is our render function we like to pretend it wasn’t our mistake so we call it a “bug.” Fixing that mistake is called debugging. So here we are with a bug in our render function. That is to say, the bug might be in the render function, or in the functions it invokes or in the functions they invoke, etc. Trying to follow the trace of function invocations feels sometimes like going down the proverbial rabbit hole. Our coffee goes cold and our emails go unanswered as we hunt around for the sneaky creature. Meanwhile deadlines loom, tension rises, the coffee, long cold, evaporates and becomes a sticky goo in the bottom of the cup when suddenly, just when we’re getting desperate, a flash of insight reveals the problem. We climb out of the rabbit hole and proudly proclaim: We have found the Bug and Squashed It Dead. Everybody rejoices. The Bug Is Dead, The Bug is Dead. We are hailed as the great Bug Squashers. It’s such a great feeling to fix a bug that it almost seems better to make a mistake and debug it later than to do it right in the first place! Almost. It’s an even better feeling to see what our artists do with the software when it works right. It’s always so creative and sometimes quite surprising. We always try to give them the best, most intuitive and easiest to use software possible. Often we end up doing things quite differently from coders elsewhere, just because we feel it is the best solution for our artists. The Render Department works hand-in-hand with nearly every department in the studio. The department’s most basic responsibility is the production of frames. All final work from each department is fed to the Render Department, where it is pulled together and the images (aka “frames”) are calculated by the computers (aka “rendering”). The frames are then passed back to each department so that they can see what their work looks like in relation to the other departments’ work. Throughout the process, the Render Department is responsible for efficiency. A computer can take up to two or more days to calculate all the information that goes into a single frame. At an average of 129,600 final frames per film, the time and energy cost of rendering is extremely high. The Render team works hard to minimize the number of calculations per frame while retaining the high visual quality expected of a Inventor Heads film. Though the Render Department’s work is important, it can be nearly invisible in the final product. The team takes pride in keeping production as smooth and efficient as possible so that the movie can be keep pace with the myriad of deadlines and technological advances it faces during the production lifetime. © Copyright 2017 The Inventor Heads - All rights Reserved.